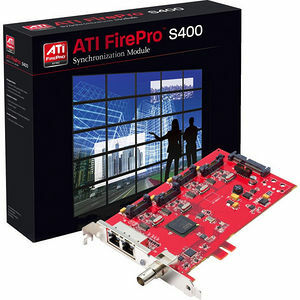 The ATI FirePro™ S400 synchronization module allows AMD FirePro™ 3D workstation graphics cards to be used in demanding applications that require synchronization to external sources (Genlock) or synchronization of 3D rendering of multiple GPUs in different systems (Framelock). The combination of these capabilities with AMD FirePro™ graphics accelerators means that an even wider set of applications can benefit from the award-winning AMD FirePro™ line. Based on a dedicated processor design, the ATI FirePro™ S400 ensures frame-accurate synchronization for video walls, multiscreen presentations, 3D visual simulators, etc.